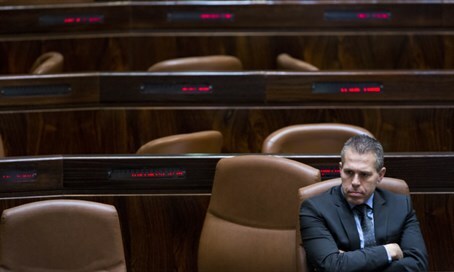 Gilad Erdan will take control of countering the boycott movement against Israel, as Foreign Ministry officials fume. The government will discuss on Sunday a proposal to concentrate all powers to counter the Boycott, Divestment, and Sanctions (BDS) movement into the Strategic Affairs Ministry, headed by Gilad Erdan. The text of the proposal, obtained by Haaretz, states that "all activities of government agencies relating to this area, including cooperation with NGOs in Israel and abroad will be regularly coordinated with the Ministry of Strategic Affairs." As for the Foreign Ministry, which has been responsible for fighting the boycott against Israel for years, it "will continue to promote the goals of Israel, including in the field of battle, all in coordination with the Ministry of Strategic Affairs." To help the Strategic Affairs Ministry assume authority over the fight against BDS, an independent legal adviser will be appointed. In addition, a "joint team headed by the Director-General of the Prime Minister's Office and composed of senior representatives from the Internal Security Ministry, Prime Minister's Office, Civil Service Commission and Finance Ministry will examine the subject." This team is expected to recommend additional funds and materials for the Strategic Affairs Ministry in order to combat BDS. Employees of the Foreign Ministry, a larger office with far more resources, were considerably irked by the proposed plans to "duplicate, for unclear reasons, a body that already exists within the Foreign Ministry." "Instead of giving the appropriate budget to the BDS department within the Foreign Ministry, the government of Israel has devoted resources 50 times higher for the Strategic Affairs Ministry," worker's committee chairman, Hanan Godar, fumed. Erdan, however, has made clear since his appointment in May that fighting BDS is one of his main goals; as Hasbarah Minister, he was also granted a pledge of 100,000,000 shekels ($25.7M) exclusively for coordinating international events to counter the BDS movement.